BROOKLYN, N.Y., Jan. 3, 2017 (SEND2PRESS NEWSWIRE) — Pratt Institute — Thousands of young athletes and their families and friends spent New Year’s Weekend 2016/17 at the 43rd annual Colgate Women’s Games. The nation’s largest women’s amateur track and field series featured some of the East Coast’s best talent continuing to set a fast pace for the indoor track season. In the High School division Friday, Iantha Wright of St. Johns Prep in Queens won the 55m with a personal best race time of 7:11. The Colgate Women’s Games’ 2015 High School champion sprinter also won the 200m in 25.74. Sophia Myers of Queens High School won the 55MH in 8.27. Both of these Junior Olympic champions achieved more than a dozen first-place wins in a wide variety of events through the outdoor season as well. Fourteen year-old Junior Olympic champion New Jersey’s Athing Mu of Trenton Central High School, fresh off two personal records at the Jersey City Armory this month, scored another double win placing first in the 400m in 58.49 and the 800m in 2:19.7. 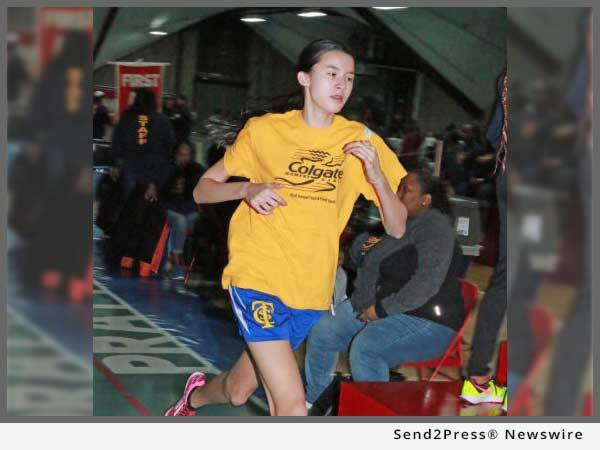 In the Mid School division Saturday, Zeyonna Davis of Cherry Hill, NJ also ran her personal best (26.76) this month in a first place win at the Jersey City Armory; and this week in an upset over Mid School champion Brianna Brown of the Bronx, her personal best got better winning the 200m in 26.27. Brianna Brown easily won the 400m, improving her time this week to 59.86. Newcomer Lauren Prince of Fernwood Avenue MS in Egg Harbor Township, NJ continues to impress with another win in the 55m, this week in 7.26. Eighth grader Tia Taylor also of Egg Harbor won her second straight hurdles, this week in 8.55. In distance races, returning Colgate Games Mid School champion Lauren Heskin of Floral Park Queens won both the 800m (2:21.89) and 1500m (4:51.73). Including Colgate Women’s Games, USATF Junior Olympic Championships both indoor and outdoor and other championship meets, Heskin has more than 20 first-place wins in her age division throughout 2016! On New Year’s Eve Sunday three of the nation’s fastest and youngest track stars, all from Pennsylvania scored double wins. In the Elementary A division, Eight year-old Damira Allen of Chester won the 400m in 69.34 and the 800m in 2:35.64; Amirah Nesmith of Ben Franklin Elementary in Philadelphia ran her personal best indoor 55m in 8.21 and also won the 200m in 31.64. In the Elementary B division, Avery Lewis who now holds three age division records won the 55m in 7.50 and in a full second faster than Colgate Games week 1, she ran the 200m in 27.26. Lewis is the first competitor in more than 25 years to hold three Colgate Women’s Games’ records. Neffertitti Cooper also of Philadelphia held four records in three divisions in 1990-91. Participation in the Colgate Women’s Games is completely free. Girls and young women compete within their own age/grade divisions for ribbons, medals and points. Events include 55 meters, 55-meter hurdles, 200 meters, 400 Meters, 800 meters, 1500 meters, high jump and shot put. Top point scorers advance to the Finals where they compete for trophies and educational grants-in-aid from Colgate-Palmolive Company. Four preliminary meets and a semi-finals at Pratt Institute determine who will compete at the finals at the New Balance Track and Field Center at The Armory, New York Saturday, February 18, 2017, where trophies and educational grants-in-aid from Colgate-Palmolive Company are awarded to top place finishers in each grade division. Hopeful young track stars, parents and coaches can find information about the program at http://www.colgategames.com/. Top row Left to right: 1. Wright, Core & Meyers 2. Athing Mu 3. Lauren Heskin 4. Amirah Nesmith. Second Row: Brianna Brown 2. Avery Lewis; Zeyonna Davis. * Photo Caption: Mid School champion Lauren Heskin of Floral Park Queens won both the 800m (2:21.89) and 1500m (4:51.73) at the second preliminary of the Colgate Women’s Games. Including the outdoor season, the USATF Junior Olympic Champion has more than 20 first-place wins in her age division throughout 2016! "The level of competition is extraordinary for early season action, and we're already seeing some of the East Coast's best athletic talent set a high bar for the entire nation at every age level," said Meet Director Cheryl Toussaint. The Colgate Women's Games is the nation's largest amateur track series open to all girls from elementary school through college and beyond. Competitors participate in preliminary meets and a semi-finals to determine finalists who will compete for trophies and educational grants-in-aid from Colgate-Palmolive Company.